Trusts provide a valuable tool in estate planning because they serve the purposes of preserving assets, protecting intended beneficiaries, and potentially saving or eliminating estate taxes. A trust is a legal document that conveys a “corpus”, or body of assets, from the settlor (the person who creates the trust and owns to assets) to a trustee (the individual or corporate entity with the responsibility of holding the assets) for the benefit of the beneficiary (the person who will ultimately receive the proceeds of the trust). A charitable organization may also be the beneficiary of a trust. These documents should be drafted by skilled legal professionals and signed in accordance with New York State Law . Trustees selected should be responsible and qualified for the tasks required. In addition, the age of the trustee should be considered. It is not sensible to appoint a trustee who may be eighty years old when he needs to perform his duties, or a trustee who does not have a good working relationship with the beneficiary. In some cases, clients may decide to appoint a corporate trustee, such as a bank or brokerage, so that the beneficiaries do not outlive the individual trustee (requiring a Court procedure to appoint a new trustee if the trust does not name a substitute) or if they do not otherwise have an appropriate individual to act as trustee. There are potential advantages and disadvantages of trusts that will be discussed in this blog post. If assets are in multiple states, a trust can more efficiently distribute assets as opposed to the alternative, a probate proceeding in one state followed by ancillary probate proceedings in other states to dispose of specific assets. It is a myth that trusts always allow for estate tax savings, as individual circumstances may vary. Further, trusts are separate taxable entities, and are required to file income tax returns, just as an individual would be required. Trusts efficiently provide for the centralized management of assets as well as the automatic and instant transfer of assets at death without Court oversight and while avoiding a probate proceeding. Privacy concerns are enhanced because there is no public filing of documents such as a Will, as would be filed in the Surrogate’s Court . Famous individuals favor trusts because of these confidentiality concerns. Further, if the parties involved anticipate a dispute over assets, a trust affords a smoother transfer of assets because the burden of proof rests with the party objecting to the trust. In an ordinary will contest, the proponent of the will offered for probate has the burden of proof. Categories of trusts include inter vivos vs. testamentary and revocable vs. irrevocable. An inter vivos trust takes effect during the lifetime of the settlor. It is a useful legal vehicle in the event that the settlor becomes incapacitated and requires movement of assets by her trustee for her care. Inter vivos trusts often provide that the assets will be distributed to a named beneficiary upon the death of the settlor. A testamentary trust only becomes effective upon the death of the settler. It is typical for a testamentary trust to be a provision within a Will, leaving all or a portion of the estate to a trust. Common testamentary trusts are marital and credit shelter trusts, involving spouses as beneficiaries and intended to save estate taxes. In addition, testamentary trusts may provide for minor children by leaving all or a portion of the estate in trust for the minor child until the child reaches a particular age (most commonly 18 or 21), with the appointment of a named trustee to oversee and manage the trust assets on behalf of the child. If the child is financially irresponsible or if the amount of assets is substantial, the trust could be drafted to remain effective well beyond the age of twenty-one. Testamentary trusts are also used as a tool to insure that assets are left to the child of a previous marriage, rather than to the children from a second marriage. Further, this type of trust could also be used if a testator’s son-in-law is financially irresponsible and should not have access to the daughter’s inheritance. Leaving the property in trust for the daughter during her life with the balance to the grandchildren upon the daughter’s death preserves the assets. Should a beneficiary be incarcerated, he cannot accept a bequest outright. In this case, any assets intended to be left to an incarcerated individual should be left in trust. A revocable trust allows for the settlor to change the beneficiary or assets of the trust or to cancel the trust in its entirety. An irrevocable trust cannot be amended without the written consent of the beneficiaries. The trust must specifically state that it is revocable or it will be considered to be irrevocable. We remind our clients for whom we draft trusts that the trust is not legally effective unless assets are actually transferred and titled in the name of the trust. For instance, the client needs to advise its financial institution that their bank account should be titled in the name of the trust and provide the name of the trustee, so that the bank account does not continue to be held in their individual name. Real estate and other assets need to be transferred to the trust as well. A deed is to be recorded with the local land records office to effectively transfer title to the trust. It should be noted that transferring assets to a trust does not effectively insulate from potential claims by creditors. In some cases, clients have reported that their local motor vehicles department does not understand trusts and will not make the requested transfer. Further, cooperative corporations do not always understand or permit the transfer of a cooperative apartment to a trust because they are may lose control over who may occupy the apartment and are concerned about the financial responsibility of the trustee for building obligations. 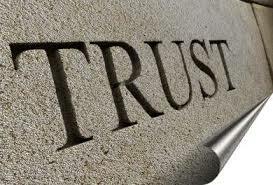 Businesses and professional practices are another example of assets that cannot be held in a trust. For any assets that are not included in the trust, whether intentionally or inadvertently, a “Pourover” Will is the solution. A Pourover Will is an ordinary will that contains a provision stating that all or a portion of the assets are to be left to the trustee of the trust and are to be administered according to the trust. Further, if minor children are involved, the Pourover Will is needed in order to establish guardians for them, as such provision cannot be made in a trust. Part II of this blog post will discuss other specialized forms of trusts that serve different purposes.